The new technology will be able to run on American Well's software or an existing Cisco infrastructure. 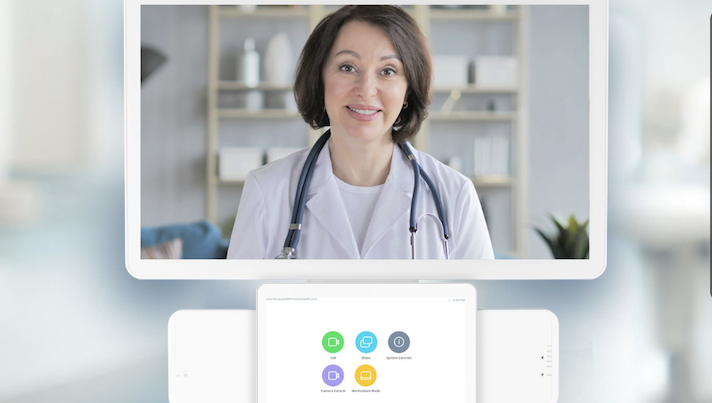 This morning telemedicine heavyweight American Well rolled out American Well 760 Cart, a new product that lets acute care teams at health systems virtually bring a specialist on site. The new technology, which can run on American Well’s software or an existing Cisco infrastructure, is an FDA-registered Class 1 device. The company said that the new technology could be used in myriad of situations including telestroke and telepsychiatry cases. For example, the system would let an emergency room physician connect to a neurologist if a stroke was suspected. The neurologist would be able to see the patient, scans and records, and then assist the ER doctor in getting the right diagnosis and treatment. In addition to the main goal of bringing a specialist into the room, the cart will include touch panel controls, a high performance camera with a 20x zoom to increase image clarity and the Cisco Plus Codec. The new technology was designed to help give clinicians in hospitals more access to specialists. American Well is amongst the best known telemedicine companies in the US. In fact, according to a recent survey done by mobile app analytics firm App Annie, it is the most downloaded telemedicine app in the country. It is also a particularly well funded company — over the summer it raked in a whooping $365.4 million in funding. This isn’t the first time American Well has shown interest in the acute care space. In fact, in April the company announced that it was acquiring fellow telemedicine company Avizia for an undisclosed sum. The deal was expected to help the company grow its acute care capabilities.